A simple way to understand object permanence is to imagine a magic trick where the magician puts a ballin his hand, covers it with a handkerchief, waves his hand over the handkerchief, and ‘voila’, the ball is gone. Except we know that it really isn’t. And we wonder what happened to it. We have all these thoughts because we know that even though we can’t see it, the ball continues to exist, whereas for a young baby that hasn’t developed this understanding, it is as if the ball no longer exists. 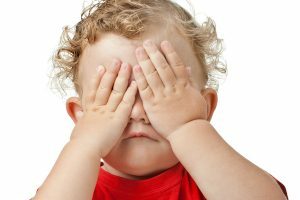 How does object permanence develop? As with most complex concepts, object permanence develops gradually through various stages. It can usually be first observed around 4 or 5 months when babies realize that partially hidden objects are still there in their entirety (to see this in action, cover part of a stuffed animal with a blanket and watch the child reach for it). At around 8 months babies are able to recover objects that have been completely hidden if the item was hidden while they were looking. By the age of one, they even look for objects that were hidden while they were looking away, but might still only look for them in the last place where they saw them. There is no clear consensus in the scientific community about the exact moment when object permanence emerges. Based on various experiments Swiss psychologist Jean Piaget, who first studied it, believed that it was around the age of 8 months. More recently, scientists have devised methods to more accurately estimate the onset – combining a baby’s bodily and facial reactions with brain wave patterns measured via an EEG. Increasingly, their belief is that it emerges around the age of 4 months. To see what some of these experiments typically look like, [click here]. Working memory: object permanence is considered a method to evaluate working memory in early stages. It is easy to see the connection between the ability to form and use mental representations of objects and their last seen location, and working memory. Working memory is a core executive function and its capacity is often considered a strong predictor of cognitive abilities at a later age. Separation anxiety: for babies to display this behavior, which usually peaks between months 9 and 18, they need to realize that Mom or Dad still exist when out of their sight. The link is very direct. This is the reason that, even though many parents struggle with separation anxiety, it is good to remember that not only it is perfectly normal, but also a sign of healthy cognitive and social-emotional development. Symbolic thought: as children’s understanding of object permanence and their ability to manipulate mental representations improve, symbolic thought gradually emerges. At around 18-20 months, it can be observed during play time, as they use an empty plastic bottle of water to represent a rocket or a wood block to represent a car. Later, they will also use symbolic thought to come up with the solution to a simple problem without having to use trial and error, as they have done until this stage. The list continues, which is the reason that understanding this concept is such an important event in a child’s overall early development. It opens a door to reaching other milestones for which this concept is a prerequisite and moves your child’s understanding of how the world works significantly forward. Your child will develop this skill over time. You can support its development through simple games like peek-a-boo and hide-and-seek, or by doing some other of your Babysparks activities specifically designed for this purpose. Once again, your baby’s play time is doubling as learning time!